Could computers reach light speed? (Nanowerk News) Light waves trapped on a metal's surface travel nearly as fast as light through the air, and new research at Pacific Northwest National Laboratory shows these waves, called surface plasmons, travel far enough to possibly be useful for ultra-fast electronic circuit interconnects. 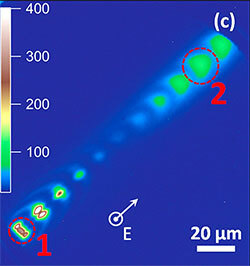 The PNNL team captured, on video, surface plasmons moving at least 250 microns across the surface. Because circuit interconnects based on surface plasmons could be much faster than current interconnects, this basic research could lead to faster computer circuits and provide significant advances in the chemical, biological, and health fields. Also, the results give insights about these trapped light waves to the scientific communities. The study experimentally confirms the linear relationship between the input light waves and generated surface plasmons. It also indicates the plasmons have a long life and low dissipation, critical fundamental information needed to use the waves in circuits and other applications. When a surface plasmon is generated on a metal surface, it can be observed by using laser light to emit electrons. By detecting these photo-electrons, with a special instrument called a photoemission electron microscope (PEEM), the scientists explored the nature of surface plasmons. In their experiments, the team applied two laser pulses to the sample: one is called the pump, used to generate the surface plasmon; the other is called the probe, used to detect the plasmon. The probe pulse strikes the sample and detects the plasmon at different time delays. By continuously tuning the time delay between the pump and probe pulses, the team monitored the motion of the plasmon on the gold surface, finding that the wave traveled up to 250 microns on the metal surface. 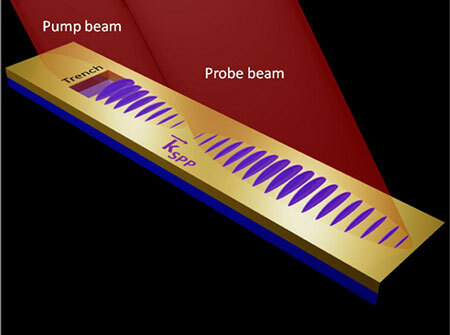 "The distance is surprisingly long because plasmon waves don't propagate like a normal free space wave," said Dr. Yu Gong, a scientist at PNNL and the lead author on this study (Nano Letters, "Ultrafast Imaging of Surface Plasmons Propagating on a Gold Surface"). "In our case, the plasmons travel unexpectedly long distances in metal films." The team applied numerical simulations to further confirm their experimental results. Now, the team is exploring how to control the propagation of the surface plasmon. For example, how efficiently can the surface plasmon be generated? How can it be guided? How can it be stopped? The scientists are using the PEEM and other resources, including those in DOE's EMSL, to answer these and other questions. The results are crucial to making circuits that operate at light speed a reality.